Next stop, Chicago! That's the shout from conductor Martha Day Zschock, who has taken children and their delighted parents on Journeys Around Boston, New York, San Francisco, Washington D.C., Philadelphia, Maine, Nantucket, and Cape Cod since starting this bestselling series in 1999. Hop aboard the L, circle the Loop, board a water taxi, walk the waterfront! 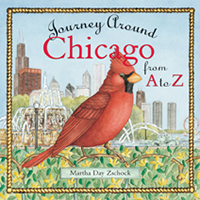 From the Lincoln Park Zoo to Wrigley Field, from the Magnificent Mile to Navy Pier, Journey Around Chicago from A to Z takes readers on a tour of the "Second City" that is second to none. Over 250,000 copies of Zschock's work are in print, perhaps because Zschock is not only a brilliant artist but also a committed educator, whose books are embraced by teachers and principals nationwide.